Some of the UK’s finest young musicians perform in what is set to be an astounding evening of music at the Coronation Hall, book early to avoid disappointment – this is an evening not to be missed! 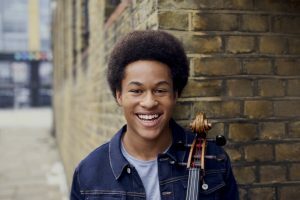 Sheku Kanneh-Mason is the 2016 BBC Young Musician, a title he won with a stunning performance of the Shostakovich Cello Concerto at London’s Barbican Hall with the BBC Symphony Orchestra. Sheku has an exclusive recording contract with Decca Classics and his first concerto recording for the label will be released in 2018. In September 2017, he started a full-time degree course at the Royal Academy, studying with Hannah Roberts and, in July 2017, participated in the Verbier Festival Academy in masterclasses with Frans Helmerson and Miklos Perenyi. Sheku is passionate about the importance of making classical music accessible to all and is the first London Music Masters Junior Ambassador. With his siblings, the Kanneh-Mason seven-piece ensemble, he has performed in many venues across the UK including at Marlborough House in front of HRH Prince Charles for Commonwealth Day. He plays an Antonius and Hieronymus Amati cello c. 1610 kindly on loan from a private collection. Isata Kanneh-Mason is twenty-one years old and is an undergraduate at The Royal Academy of Music, studying piano with Hamish Milne, having been awarded the prestigious Sir Elton John Scholarship. She performed with Elton John in Los Angeles in 2013. Isata was in the Piano Category Final of The BBC Young Musician 2014, winning The Walter Todds Bursary for the most promising musician before the Grand Final. She won two ABRSM Gold Awards at age 10 and 11 for the highest marks in the UK for grades 7 and 8 Piano. She has performed across the UK and abroad in venues such as the Wigmore Hall, The Royal Festival Hall, St Martin-in-the -Fields, The Duke’s Hall (Royal Academy), The Royal Concert Hall, Nottingham.